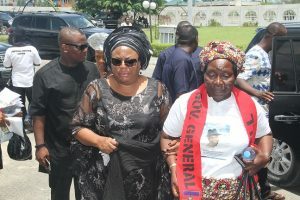 Mrs. Magareth Alameiseigha, the widow of the First Executive Governor of Bayelsa State, Late Diepreye Solomon Alameisegha, yesterday exonerated the leadership of the All Progressive Congress (APC) from the events which led to the October 2015 death of her husband. According to Mrs. Alameiseigha, though the events leading to the last year death of her husband sparked off controversy between the PDP and APC ahead of the Governorship election, the killing of her husband started with his removal from office,arrest,trial and seizure of owned properties under the leadership of the PDP. acts that may cause them to betray their leaders.